The first day of a brand new season holds so much promise. I'm setting my sights on a morning walk several times a week. I've gotten out of the habit. It's time again. 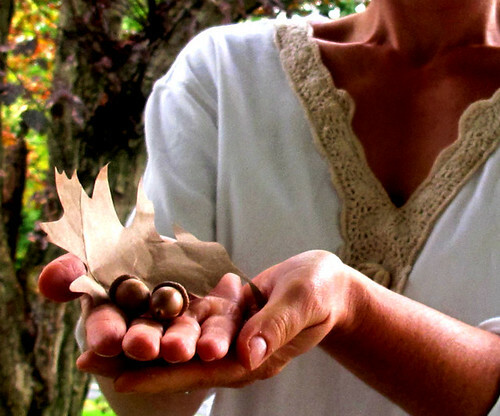 On today's walk, I collected acorns... and thoughts before I dove in to my very full plate. The gathering of those thoughts steered me in the right direction. I know that prioritizing a new goal will touch every part of what I do. Maybe you'll join me in choosing something new to accomplish this fall. Here's to new beginnings. I like the neckline on your shirt..it looks great!!! We have an afternoon walk everyday in our forrest and I really enjoy it, every day again. Look so much forward to all the amazing Autumn colors! that morning walk sounds wonderful. the gym often gets a bit too much and it sounds more relaxing to enjoy the outdoors. i would love to find little treasures like you found. walking the dog every morning (early) and every evening after dinner has really changed my life. being outdoors every single day is like soul exercise!